Recently, I shared some Thanksgiving printables, but for those who are drawn to a more traditional autumnal color scheme, today’s post is for you! 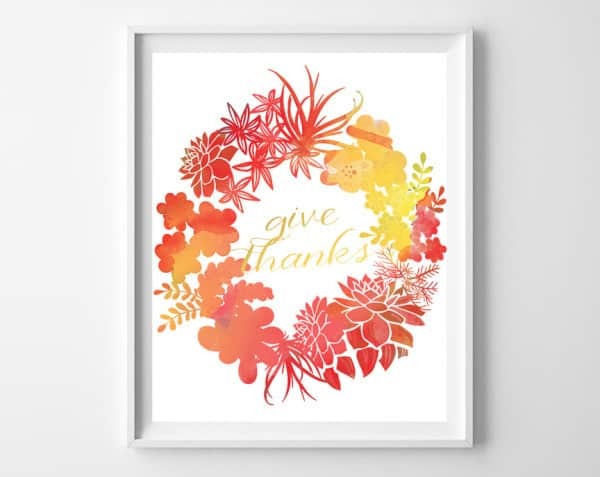 This give thanks printable features a soft watercolor palette of red, orange, yellow and gold, and is the perfect seasonal decor piece to get your home ready for the changing of the seasons. Download, print, frame (or hang with strips of washi tape) and you’re done! You can either print at home on cardstock or glossy photo paper, or send to your favorite photo printer (file is sized to 8×10). Looking for more ways to get your home ready for Fall? Check out my Fall paper wreath and these easy (and yummy) dipped marshmallows! There’s lots more Fall inspiration, including crafts, recipes and home decor, on my Fall Pinterest board! Thanks for reading all about my give thanks printable! Have a crafty day! This printable is really artistic. Thanks for sharing!